Acting Sergeant Brendan Whitefield said the semi-trailer was fully loaded with "thousands and thousands" of chickens. 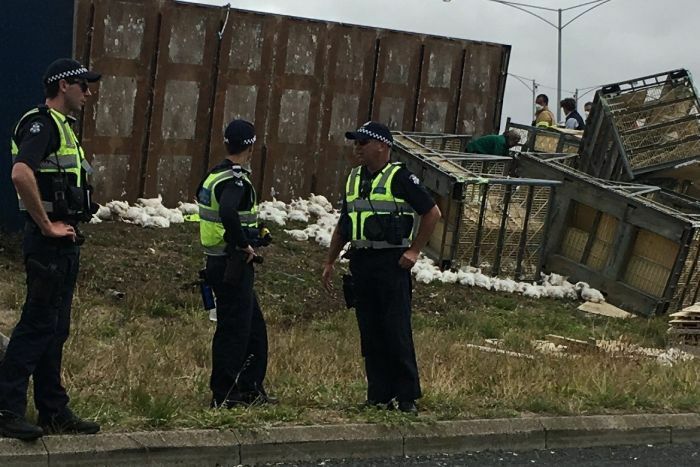 The clean-up is continuing after a truck carrying thousands of chickens crashed over the side of an overpass in Geelong, scattering crates of chickens across the embankment below. The truck rolled off the side of the Princes Highway overpass at North Geelong about 10:15am, landing on an embankment beside Corio Quay Road. The truck driver, a 58-year-old Drysdale man, injured his arm and was taken to Geelong Hospital in a stable condition. Acting Sergeant Brendan Whitefield said the semi-trailer was fully loaded with “thousands and thousands” of chickens. He said while many birds survived the rollover, a number of others were killed or injured. “It’s been a very stressful operation and I’m sure it’s taken quite a toll on those who are still at the scene,” he said. A large truck lies on its side next to the road. Police standby and crates are strewn next to the truck. 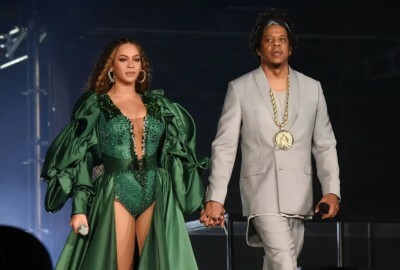 He said the local council’s animal management teams and vets were called to help deal with the poultry, euthanase injured birds and recover survivors. “It’s distressing, no-one likes to see that sort of stuff, it was a horrendous scene,” he said. 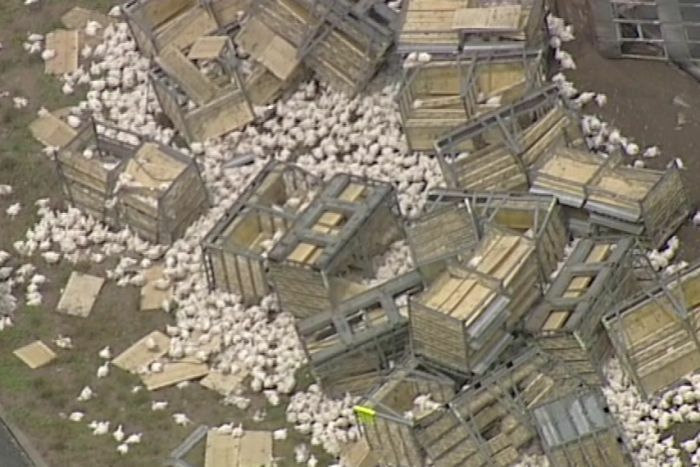 Hundreds of chickens appear to have died after the truck rolled off the highway. Police say it is unclear what caused the rollover. But the incident has caused significant traffic congestion throughout the day. Police said once the clean-up of chickens was complete, crews would start work on righting the truck. They said once the scene was cleared, it may take some time to replace barriers on the side of the bridge which were damaged during the incident. 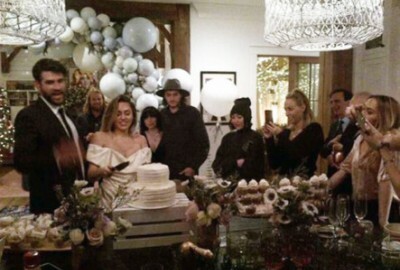 This article was written by ABC News. See full news report here. 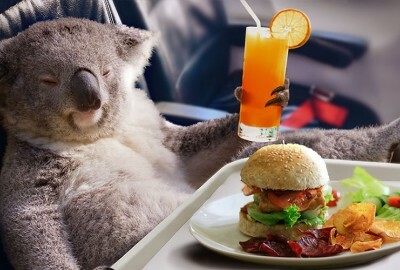 Animal Liberation Victoria's 'Vegan Easy' has just launched a new ad in Jetstar's in-flight magazine, on-board planes across Australia and internationally. 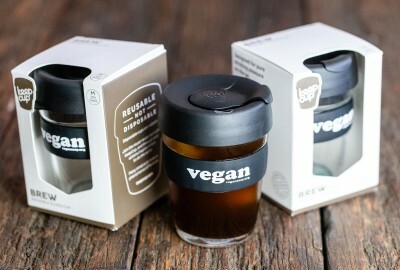 The Vegan Keepcup is here! Need some peace of mind in the coffee line? 'Soy' it loud and clear with our limited edition vegan KeepCups. 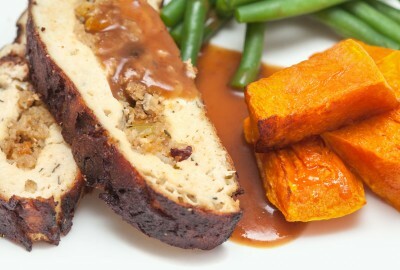 The vegan fast food revolution is coming and there’s not much carnivores can do to slow it down. Treat yourself to a mouthwatering vegan spread this Christmas as we rustle up our best holiday recipes.